New research has shown that a small electronic unit may help restore balance to patients suffering from Parkinson’s disease by applying electric noise stimulation. 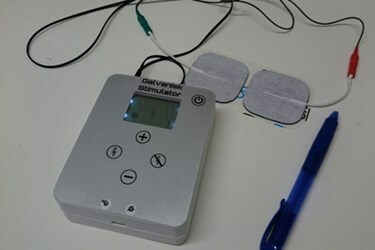 The device provides electrical stimulation to the organs that monitor balance, which compensates for shortages of dopamine and restores motor skills and balance. Originally tried in rats, the technique has now shown some benefit in humans. The development of Parkinson’s disease is a generally a slow process. Eventually, however, patients are faced with loss of motor control, tremors, stiffness, and sometimes a loss of balance. Many of these symptoms are caused by insufficient levels of dopamine, a signaling substance that is usually treated with medication. Balance problems, however, are persistent and usually prove resistant to medical treatment. To address this problem, researchers at Sahlgrenska Academy developed a new electronic device, according to a recent article from the University of Gothenburg. The device works by applying a small amount of electrical noise to neural tissue, and it has been developed into a portable prototype. To test the device, the Sahlgrenska team applied it to Parkinson’s patients in both medicated and unmedicated states. Testing was conducted in a double-blind, placebo-controlled, cross-over manner, according to a recent study published by the team in the journal Brain Stimulation. Adding noise stimulation improved the balance of the patients and alleviated the combined symptoms of the disease. Generally, patients could not detect when the device was active, but when a slight push backward was given, it led to a more rapid balance recovery. Additionally, how much the patient swayed when their eyes were closed was significantly reduced. Effects of medication and the stimulation together led to other interesting results. “The effect on balance was particularly apparent when the patients were in the unmedicated state, which is very positive,” said Sahlgrenska Academy associate professor Filip Bergquist in the article. The prototype device has been reduced to about the size of a wallet. The team’s goal is to perform long-term studies with the new treatment to see if benefits persist. If long-term benefits do exist, the team plans to begin development activities and hopes to bring the solution to market over the next five years. The current study was conducted in collaboration with NASA, which assisted with some of the technical equipment required. As Parkinson’s disease develops, a key challenge is getting healthcare providers to empathize with or understand the condition affecting the patient. Recently, developers created an immersive technology that exposed people to certain aspects of the disease to help improve this understanding.